Below are the remarks from the January 16, 2018 “Off the Couch” viewing of Phantom Thread with Randall Paulsen, MD, Psychoanalyst Member of BPSI. “Off the Couch” is part of a decades long collaboration between The Coolidge Cinema and BPSI. 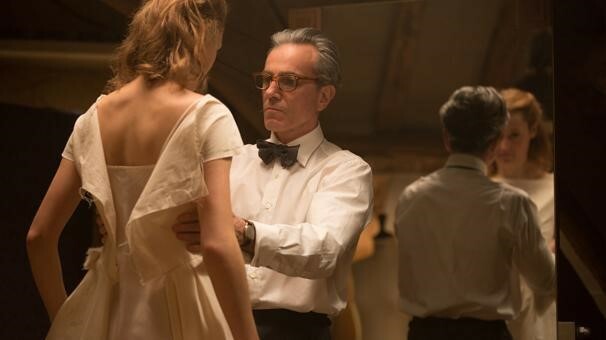 Phantom Thread is set in the glamour of 1950’s post-war London. Renowned dressmaker Reynolds Woodcock (Daniel Day-Lewis) and his sister Cyril (Lesley Manville) are at the center of British fashion, dressing royalty, movie stars, heiresses, socialites, debutants and dames with the distinct style of The House of Woodcock. Women come and go through Woodcock’s life, providing the confirmed bachelor with inspiration and companionship, until he comes across a young, strong-willed woman, Alma (Vicky Krieps), who soon becomes a fixture in his life as his muse and lover. Once controlled and planned, he finds his carefully tailored life disrupted by love. Daniel Day-Lewis stated that Phantom Thread will be his last film. For the film, he completely immersed himself in the study of fashion, and in the craft of tailoring fine dresses. He learned to sew fine dresses and made a complete replica of a classic Balenciaga dress prior to filming the movie. The callouses that you can see on Day-Lewis’s fingers are real and you would see similar little scars on the hands of any devoted dress designer and maker. Paul Thomas Anderson and Day-Lewis have great improvisational chemistry as actor and writer/director. I want to offer some psycho-analytic musings about Reynolds Woodcock as the patient, Alma Elson as the therapist and Cyril Woodcock as the guardian caretaker. Meanwhile Reynolds, a tailoring prodigy, discovered the taste for sewing secret labels in his dresses – secret labels, such as the lock of his dead mother’s hair sewn into the jacket he wears. The sureness of a physical link seems superior to the emotional link it has replaced. There should be a warning for Alma too. She seeks to love him in her way, but her headstrong offer of a secluded dinner that includes buttered asparagus results in her being told to go back to “where she came from.” As in psychoanalysis, all parties to the treatment in this movie are vulnerable to change. Reynolds, Alma, and yes, Cyril have been changed by the movie’s end. Breaking Ice. There are many attempts to break ice by force. Alma breaks the icy breakfast silence by scraping butter on her toast, creating a waterfall pouring tea, disrupting the frozen stillness by her movements. Reynolds wipes the lipstick from Alma’s lips. “I want to see who I’m talking to.” But does he? Later, Reynolds is still frozen when he shouts at the disappearing Alma, “the tea may be leaving, but the interruption is staying with me!” Some thawing is already occurring here. He is feeling something he has been trying to prevent, a disruptive experience that remains in his body. Ultimately the best way to deal with ice is not by crushing or shattering but melting. Melting forces comes from inside Reynolds (“hungry boy,” “butterflies,” “not feeling right,” “only half alive”) and melting warmth from the outside (the love Alma offers, even the mushrooms she sautés). Ultimately ice becomes water. Reynolds’ mother dies when he is young and incapable of full grieving. The talisman of secret labels and locks of hair provide an icy, physical replacement. Reynold’s tears flow as he hallucinates and speaks to his mother. She has come to dwell more within him. The watery emotional connection replaces the frozen lock of hair. The mushroom poisoning is Alma’s final effort to change Reynolds’ chemistry. As WH Auden says, “what mad Nijinsky said of Diaghilev is true of the normal heart. Each person seeks not universal love, but to be loved alone.” Alma seeks the dominance of “being loved alone” by keeping Cyril out of the bedroom and preventing the doctor from examining Reynolds. Actions gradually are replaced by words, both spoken and heard. Reynolds, Alma and Cyril all participate in this parable of how change is affected by the process of mutual understanding. Secrets are revealed. Even labels like “never cursed” are removed. The second mushroom dose is smaller. He only takes one bite, which he chews mindfully. She confesses her battle plans by telling their content: “I want you flat on your back, helpless, with help only from me.” As he slyly chews the one bite, slowly wagging the fork in his hand toward her, he knows what she has resorted to. I believe it is Alma who says, “I finally understand you.” But they both have emerged to a clear perception of each other. What was once a struggle for dominance has become a two-person conversation. Each person has found a place in an intimate relationship with neither one needing to wipe away or destroy more of each other’s coverings, personalities, or chemistries. Change does not come at once, or easily. In this story, it takes a near-death poisoning. Reynolds emerges resurrected. The person he was before survives the changes he once feared as death itself. Warmth melts ice, but people bring their old as well as new selves into real intimacy – into marriage and procreation. The new family – Reynolds, Alma, Cyril and the baby – is the last image we see. Randall Paulsen, M.D. is a psychiatrist, Training and Supervising psychoanalyst, and a past president of BPSI. He is an Assistant Professor of Psychiatry at Harvard Medical School and currently works as the mind-body consultant in the Osher Clinical Center at Brigham and Women’s Hospital. He led Balint groups for physicians and directed Primary Care Psychiatry at the Beth Israel Deaconess Medical Center from 1987 to 2000. He has a long-standing interest in the role of psychoanalysis and psychotherapy within the healthcare system. He has a private practice of psychoanalysis in Lexington. Randall Paulsen can be contacted by email here. The opinions or views expressed on the Boston Psychoanalytic Society & Institute (“BPSI”) social media platforms, including, but not limited to, blogs, Facebook posts and Twitter posts, represent the thoughts of individual contributors and are not necessarily those of the Boston Psychoanalytic Society & Institute or any of its directors, officers, employees, staff, board of directors, or members. All posts on BPSI social media platforms are for informational purposes only and should not be regarded as professional advice. BPSI does not control or guarantee the accuracy, relevance, timeliness or completeness of information contained in its contributors’ posts and/or blog entries, or found by following any linked websites. BPSI will not be liable for any damages from the display or use of information posted on its website or social media platforms. BPSI cannot and does not authorize the use of copyrighted materials contained in linked websites.